This year has been a wild and exciting ride for the company, and things seem to keep getting better. A few weeks ago, we received a letter in the mail carrying some pretty surprising news — Track5Media is a nominee for the Central Penn Business Journal’s Business of the Year award! When our president, Oliver Feakins broke the news, we were almost in disbelief. After a calm week, the announcement was a shot of pure joy. For such a small and close-knit company, a nomination like this is really impactful. Although we may be national leaders in the job board industry, we still approach each day looking to improve. Needless to say, we’ll never claim humility because that’s the whole point. Still, it feels great to supplement this past year such a great honor in the region. And if their Business of the Year nomination wasn’t enough, Oliver recently found out he was also nominated for the CPBJ’s Forty under 40 Award. A good time for Track5Media indeed! Where implementing new ideas and taking risks feels forced process for some, these things remain core values at Track5Media. With our newest brand, Senior Caring the risk is very real — it’s a serious subject for many families and the competition is fierce. Yet, at no point have we ever doubted our ability to bring this vision to life. Through inevitable staff changes, moving to a new office, and learning curves, the momentum is stronger than ever. In creating this write-up, I really got to thinking about the reasons for these nominations. Two words kept coming to mind: Living innovation. So much of being a digitally-focused company means staying on the edge of the industry. Every day we scour the web for whatever digital nuggets of value we can acquire for the betterment of our clients. That said, we bring that pursuit for innovation to life in every way possible — or rather we live to innovate. 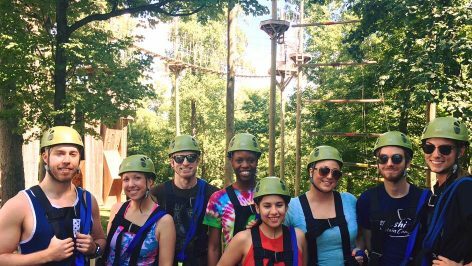 For examples, look no further than our in-house massage days, ice-cream outings, and zip-lining team building. I mean come on, we have an actual “fun committee” — how many companies can say that? I mention this because it’s from the working environment that success can sprout. Working in an open office space with open doors and easy communication is second nature at this point, and we don’t take it for granted. Track5Media’s zip-lining adventure at Refreshing Mountain. There is a creative vibe flowing throughout Track5Media, even on tired Monday mornings and the lull of a Thursday afternoon. As we prepare to launch our newest site, Senior Caring, we’re looking toward a future of growth in an exciting time. 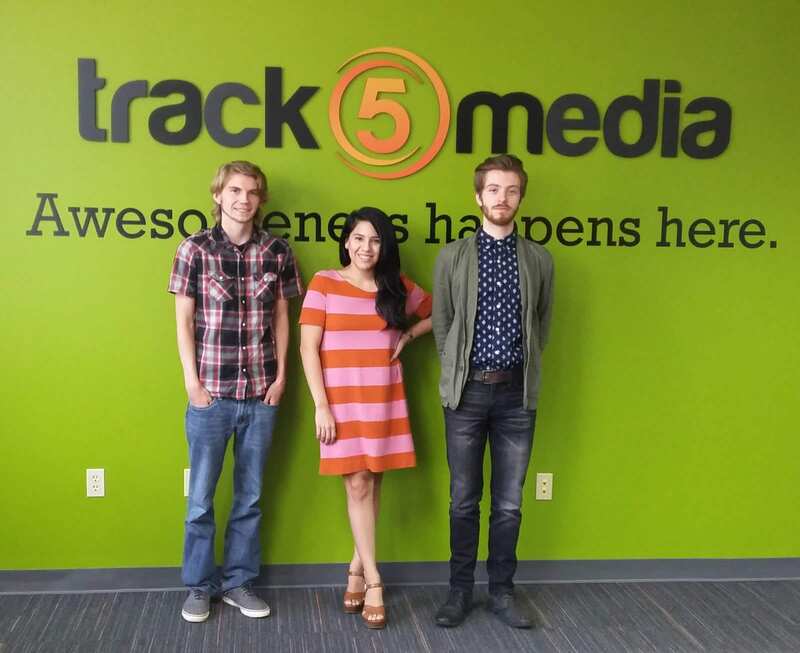 Whatever happens at the awards ceremony, we know that (as cheesy as it sounds) Track5Media is OUR business of the year past, present, and future. Earlier this week, Google announced that there will two changes coming to mobile search in 2017. With this announcement, Google may have single-handedly signaled the end of the ad blocker war. Mobile users, prepare to say goodbye and good riddance to annoying and intrusive interstitial mobile ads! Publishers, prepare to optimize your mobile sites or be hit with the wrath of Google. I’m going leave you with some tips to optimize your mobile site to make sure you’re not penalized, but first, let’s explore why Google had to make this change. If you remember back in April, I wrote a three-part blog series about the rise of ad blockers. I really suggest you read it to get a full view of the intrusive ad problem, but I’ll give readers pressed for time a brief summary. 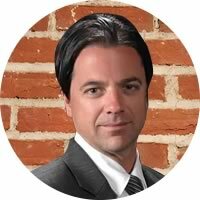 I discussed the rise of the digital ad tech war that continues to wage between content consumers and publishers. Between January 2013 and January 2014, desktop ad blocking increased 124 percent. By 2015, over 198 million internet users were using ad block plug-ins on their desktop. When consumers blocked ads, they also saw significant decreases in their monthly data usage. This left consumers and publishers in an ad tech stalemate of sorts. Publishers want readers to understand that the “free” content they provide is paid for by the ads. Consumers want publishers to stop making ads so annoying and intrusive that you cannot even access the publisher’s content. What is the solution? Who else would save the internet from itself except Google? With Google Search, the goal is to “help users quickly find the best answers to their questions, regardless of the device they’re using”. We know this is certainly true, evidenced by Mobilegeddon 2015 when sites with non-mobile friendly pages were dropped from organic rankings. So what are the changes that could pose the start of Mobilegeddon 3.0, and the end of the ad blocker wars? The first change is that Google will be removing the mobile-friendly label on mobile search results. The reason for this is that Google recently found that “85% of all pages in the mobile search results now meet [mobile-friendly] criteria”. However, they also want webmasters to know that the mobile-friendly criteria will still be a ranking signal. 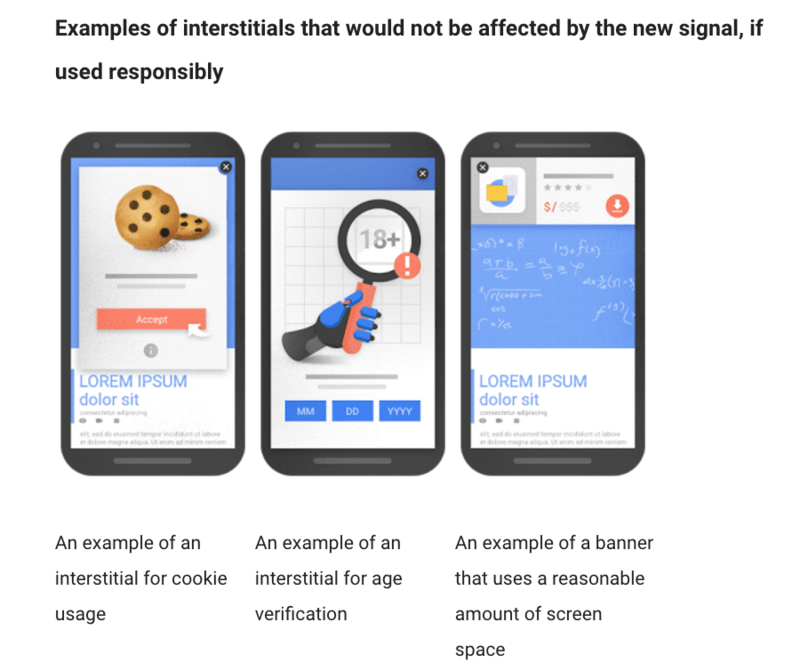 Sayonara Annoying Interstitial Mobile Ads! The major change that will certainly delight web users who do not employ ad blockers is the crackdown on intrusive interstitial mobile ads. 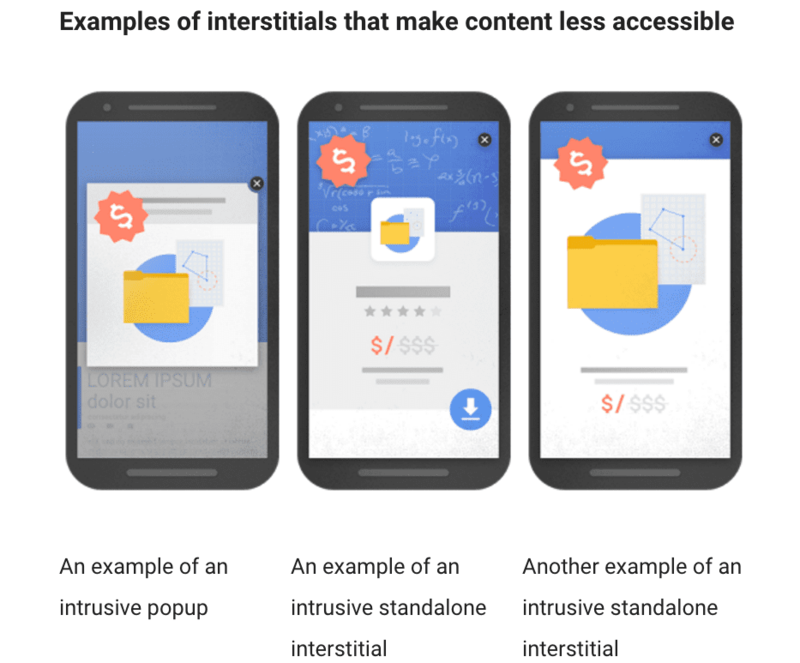 While many pages are now mobile-friendly, according to Google (and anyone who uses the internet on mobile devices) many of these “pages show intrusive interstitials to users”. Google’s issue is that these intrusive ads provide a miserable user experience. Users are super frustrated because they cannot access the content they are searching for. If your site provides users with a poor ad-filled mobile experience, Google will start lowering your rank in search results. Google gave some examples of what they do NOT want to see. If your site is utilizing any of these techniques to serve ads on mobile, Google will deem your site problematic. Displaying a standalone interstitial ad that the user has to dismiss before accessing the main content. You still have time to serve annoying interstitial mobile ads before being penalized. However, if Mobilegeddon taught anyone anything, it’s that Google does not mess around when it comes to user experience. If your mobile website is providing a problematic experience, you have until January to fix it! This is another installment of a series we’d like to call Track5Takes. Throughout the week, we come across a variety of interesting subjects dealing with marketing, social media, and technology among other things. Our staff often discusses these articles or videos, with each of us forming our own opinions. We’d like to not only inform you about what’s going on in the web-marketing and technological world, but we want to show a little personality by giving our own “takes” on various issues. 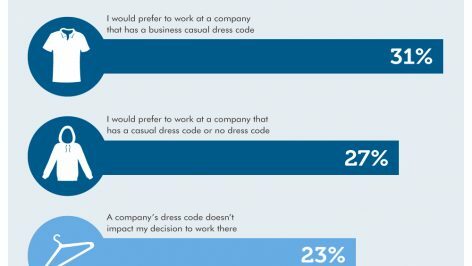 This week, we came across an article titled, “Why the Office Dress Code is Slowly Dying.” It was brought up during a marketing meeting, and it got many of us thinking about not just our current dress code here at the office (there is none!) as well as previous dress codes we’ve experienced at our former businesses. While our office sports a variety of interpretations of the “casual” look, many of us still had similar experiences and opinions on our lax office dress code. We not only recounted our opinions and experiences with dress codes, but we even got a little insight from our Vice President Ben Joerg on what went into implementing the “no dress code” policy. Oliver and I first off have always been into casual vibe and always felt if we brought employees on why should it be any different for anybody else? We also believe that being in your comfort/casual clothes makes one feel better and hopefully translates to a better workflow for each person every day. Who wants to wear a tie and be in formal dress all day? Save that for the weddings – we like to be a trend-setter and also make this a perk that will entice other folks to come and work with us here at Track5Media. Until there comes a day when wearing full suits and leather shoes makes sense in the height of summer, I’m thinking the dress code will stay down for the count. For us at Track5 it makes sense to keep everything so casual since our clients are rarely (if ever) in the office. My first summer job like so many other central Pennsylvania teenagers was at Hershey Park as a rides operator. That meant starchy, ill-fitting khaki shorts and an awkward polo that always seemed to have an irritating tag. As a reaction to that gig, I took up lifeguarding for a summer with a daily wardrobe of Red Cross certified shorts and a faded bandana to keep my hippy-locks out of my eyes. At this point, it was clear that standing in the hot sun for hours wasn’t an ideal work environment for me. That led to a series of retail mall jobs at places like Teavana and Clarks. Wearing aprons, as a barista was okay because you kind of feel like a tea wizard, and who can argue with free shoes and a belt from Clarks to tuck your shirt in with? It’s nice that everyone at Track5 can wear whatever they like; I think it’s a great way for people to communicate who they are by way of appearance. The upbeat vibe would quickly diminish if we were all stuffed into formal wear and that’s not good for anyone! I really love this idea of a casual dress code in the workplace. We are all adults who know what’s appropriate. People should be able to wear what makes them feel good, and empowered to take on another workday. And working part-time at Michael Kors, I can attest to the fact that designer brands are becoming much more versatile. That’s actually the essence of the brand, Michael designs specifically for the working professional on the go. I was honestly shocked that we had a very lenient dress code in place here at Track5Media. At the time, I was working for a retail-clothing store that required you not only to dress in business-casual attire, but also to exclusively wear only the company’s clothes. Yes you heard that right. After making minimum wage, I was “strongly encouraged” to spend that money at the same store I was working at. This hellish paradox meant that I was pouring my income back into the same business for the sole purpose of meeting their dress code. Needless to say, I was relieved to learn that the office dress code at Track5Media was much more relaxed. Although I still prefer jeans and a dress shirt, it’s nice to know that if I’m late, I can throw on a sweatshirt and baseball cap and not feel judged. I love that we all have our own interpretation of the word “casual” and I wouldn’t have it any other way. Not only are we comfortable in our clothes, it makes us comfortable when interacting with one another. We’re able to show some personality in our work attire and this leads to a stellar work environment for all of us. Breaking Broadcast: Trustworthy Social Media? Facebook recently announced that their trending topics section displayed political bias due to employee curation. This reminds us just how distinctly news has shifted with the rise of social media. With more people on mobile devices and the Internet, social media is changing how we consume and interact with new information, as well as with news brands. In the last decade, we’ve seen so many significant changes to electronic media that it’s hard to grasp. Platforms like Twitter and Facebook have altered our access to everything from world events and political campaigns, to social injustices. Now the consumer’s standpoint in the media has changed. This means business models for traditional media sources can only continue to adapt their efforts in the face of digital platforms and even things like algorithmic topic generation. Think about it, between Hilary Clinton’s email controversy and Donald Trump’s concerns over his public image as portrayed by the “crooked media,” we’re living in a world where people are forming their worldviews and political preferences based on the topics they discover via social media. 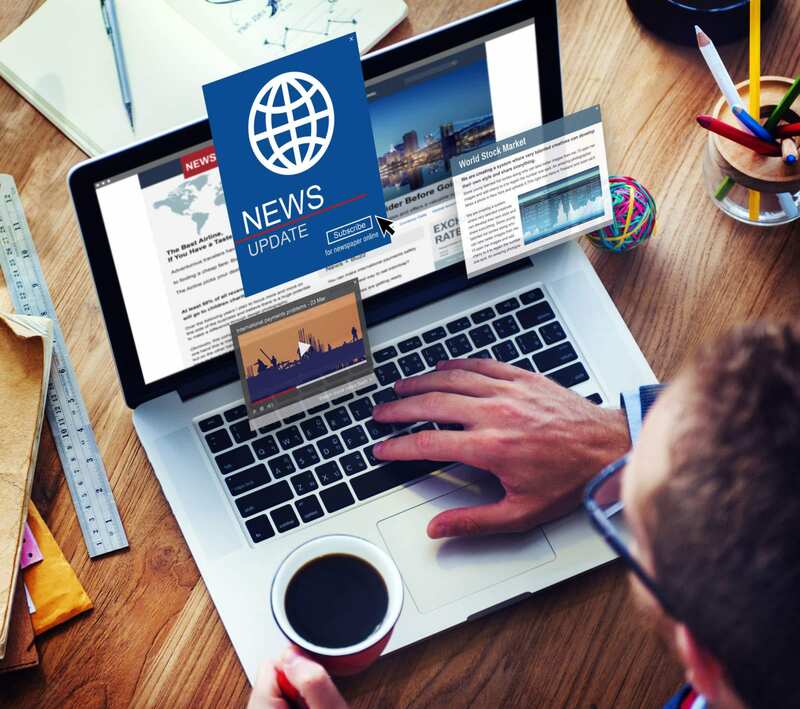 A recent report from The Reuters Institute for the Study of Journalism provided an overview of the effect this shift has had on news consumption around the world. Of the 26 countries surveyed, the report found that 51% of people say they use social media for news each week. One in ten said it was their main source of information. Facebook was the most important network for finding, consuming, and sharing topics – particularly for women and people ages 18-24. Yet, despite much more frequent consumption of news through social media, recognition of those brands decreased, especially in the UK, Canada, Japan, and South Korea. This presents a range of problems for traditional brick and mortar news agencies and their affiliates: mobile accessibility, the algorithmic selection of topics, and ad-blockers are causing major upsets in already deteriorating business models. Although they are incredibly convenient, ad-blockers have become the bane of many news agencies’ profits. Notably, monetizing audiences online remains an issue for digital-born companies like BuzzFeed and Mashable. These blockers have since caused missed revenue targets and staff layoffs. Combined with the growing popularity of automated journalism, audiences are gaining more power over which news sources they choose. Whether it’s out of convenience, preference, or the collective curating efforts of peers, the news is forming to the reality social media has presented us with. Trust in the media varies across many countries. 36% of people surveyed reported they preferred news to be preselected based on what they’ve read before. 30% said they trusted the judgment of editors or journalists. 22% felt comfortable with seeing topics based on what their friends had consumed. Being presented with topics you’d seek out otherwise is convenient. However, many are still concerned over whether automated news feeds present a darker scenario. Could this mean homogenous news consumption and planned manipulation (see the first sentence of this post)? Will the shift to online audience drive healthy competition in the world of journalism? If so, at what ethical cost? Looking at data from the countries surveyed, it was found that new formats such as live pages (15%), Listicles (13%), picture stories (20%), and infographics (8%) are preferred due to their social media compatibility. 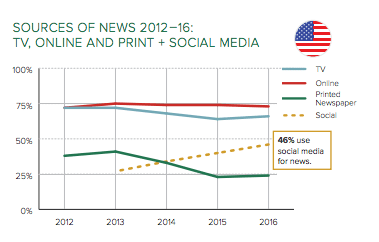 People under 35 are shifting away from television for news media. For people under 35, video formats via platforms like Facebook, YouTube, Twitter, Instagram, and Snapchat are at the nucleus of news consumption for the first time. If these trends continue, social media could eventually drop half of its name to become the main source of news in countries all over the world. Do Instagram Stories Mean Snapchat is Doomed? At the beginning of this month, social media users experienced a little (and by a little, I mean, a lot) déjà vu with the introduction of Instagram Stories. Facebook didn’t even bother to create a new name for their “borrowed” feature, making it very clear they are taking aim at Snapchat. Could this be the beginning of the end for Snapchat? Facebook has definitely targeted Snapchat before. However, it may be the first time that the future of the live stories app could actually be in danger. Snapchat is no stranger to being caught in Facebook’s crosshairs. In fact, Instagram Stories is just the latest of one of Facebook’s botched (and pretty desperate) attempts at killing off the live video app. In December of 2012, Facebook announced their new app called Poke. You could send pictures and videos that would self-destruct. You could draw over the pictures and also would receive a notification if another user screenshotted your content (No, I promise we’re not talking about Snapchat right now). By Spring of 2014, Facebook killed Poke. This is not the first time that Facebook has tried to kill off Snapchat. One of Facebook’s desperate clone attempts was Slingshot. Users could take a photo, color on it, add big white text and send it to friends (sound familiar?). The catch was that it used a ‘pay-to-play’ model, whereby users could not open pictures from friends unless they sent them. Three months from its launch in the summer of 2014, the app was killed off. Instagram Bolt was only available in New Zealand, Singapore, and South Africa when it initially launched in July of 2014. This app had the intention of allowing users to send short-lived photos and videos to others that will self-destruct with a swipe (I know, I know, This one sounds like Snapchat too!). So far, the live video juggernaut has done a great job of carving their own path in the future of social media. However, just because Facebook has failed to successfully kill off Snapchat, doesn’t mean this isn’t the mortal wound Facebook has been looking to deliver. Snapchat is a social media pioneer; one of the few originals. The same way Facebook made a “feed” the main staple of social media, is the same way Snapchat made slideshow communication popular. We should expect to see many other social networks adopt a story-like feature if they haven’t already. Right now, Snapchat has no user discovery tools. The only way you can find Snapchat users is if you have their username or Snapcode. You don’t find recommendations of whom you should follow like you do on other apps. Instagram has all of Facebook’s data at its disposal, which is a huge advantage. Could it be possible that even if Snapchat does finally introduce a discovery-type of feature, it will be too late and users will have moved on? Though more snaps are sent than IG posts per day, Instagram has about double the active users than Snapchat has (400M vs 200M, respectively). Many people already have amassed large followings on IG. If they are only going to post on one social media site, it is going to be the one that they have the most followers on. Users are already used to seeing ads and promoted posts across Facebook and Instagram. Snapchat has tried to implement monetization methods, but it’s going to take users a little bit to accept the change. All hope is not over for Snapchat. Some of the same concerns I just gave could be reasons Snapchat will stand the test of social network time. No, there isn’t a traditional feed or post structure. No, there are no navigational tabs to take you from section to section of the app. And no, the app doesn’t use likes or reshares for a user to base their worth or post success on. But yes, Snapchat breaks social media networking norms. The untraditional social network model attracts the younger demographic; long tired of having to present a perfect version of themselves online. The live video maven doesn’t require users to measure their social worth in likes or retweets. For younger users, Snapchat eases the “what you post online is online forever” mindset. Perhaps it is Snapchat’s “shortcomings” that make that much more sustainable. Instagram Stories are eerily identical to Snapchat Stories. Facebook showed they think this is a battle already won by not even giving the feature an original name. But don’t hold your breath, Zuckerberg. Believe it or not, virtual reality (VR) has been around for quite a few years. So why are we only hearing about it now? It’s as simple as timing. Consumers are finally ready to give it a try, and oh boy are they ready. You may be aware that these past few years a variety of companies have been experimenting with VR with much success, but none like Niantic’s. No one expected the mind-blowing success of PokemonGo, which has become somewhat a way of life. Now that millions of consumers around the world have accepted and integrated VR in their everyday life, what’s next? 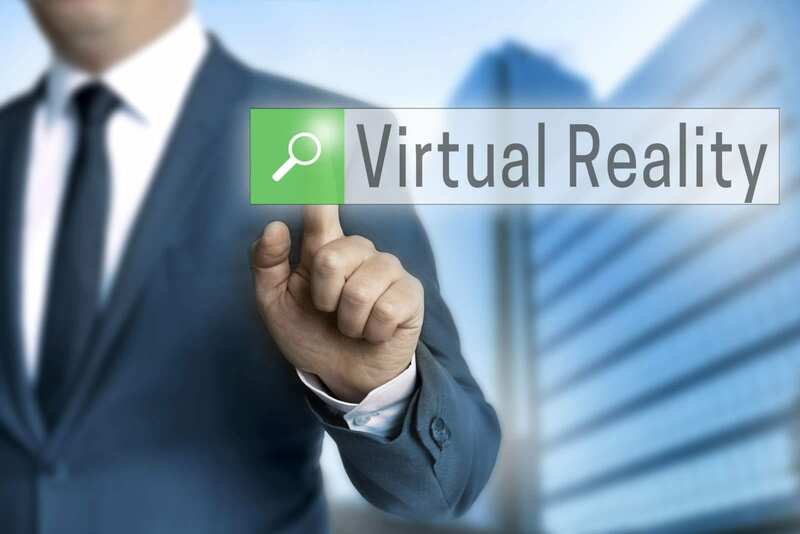 With the right execution, VR can be an incredibly powerful marketing tool. Not only is it increasingly more difficult to grab the attention of consumers, and thanks to their ever-shrinking attention spans it is also a struggle to retain it as well. But with VR, you get to have the rare gift of a consumer’s undivided attention as they are fully immersed into another reality, and amazingly not checking to see if they got any new notifications. As their senses are being stimulated and emotions running high, they are much more likely to remember their experience if done right, hopefully with fondness. A good experience is practically the keystone of marketing, and an impactful experience, like VR, almost always inspires brand loyalty. Sure, marketing that triggers emotions is the most effective, and brand loyalty is the best, but is VR appropriate for your target market? Having a solid list of pros, it raises the question of whether it outweighs the cons? At the moment the most concerning cons of using VR is cost and accessibility. Depending on the execution, VR can easily exclude those who do not have access to the required technology. And as you can imagine, the technology that goes into creating a virtual reality does not come cheap. However, many technology experts believe there is good news on the horizon. They believe that as VR becomes more mainstream, the costs of it will come down, making it affordable for companies and consumers alike. As companies are starting to experiment in the world of VR, we naturally notice a few trends. It seems that those who saw the most success were marketing campaigns that used VR to persuade consumers to try a product or service. The Thomas Cook travel agency in the U.K. experienced increased travel revenue of 190% when they used VR to promote trips to New York via helicopter rides. Not too shabby. Volvo also experienced a similar success when they launched Volvo Reality, the first ever VR test drive. By placing consumers in the driver’s seat of the coveted Volvo XC90, Volvo Reality reached an impressive 238 million media impressions. Helicopter and new car rides sound great, but trial runs aren’t the only VR campaigns that are making an impact. Companies like Hugo Boss and Absolut Vodka are creating a lot of buzz by giving people the opportunity to attend real world events virtually. And most recently, fans of the Olympics games that can’t afford the money or time to travel Rio have the chance to experience the games, VR headset required. “As the…interesting (train wreck) of a presidential race continues to dominate our living rooms, timelines and radio stations, Marketers and Developers have identified an opportunity, leading to a unique new trend in the application world.” While the current race between Hillary Clinton and Donald Trump seems like another installment of the SAW movie franchise, some app-developers are choosing to turn this cringe worthy competition into a profitable product. A recent article posted by The Ringer detailed a variety of satirical games featuring our two, very polarizing candidates. In the article, 46-year-old app developer Kevin Colligan was hit with inspiration as he watched the Clinton email scandal unfold. It’s interesting to think about exactly what had to transpire for the satirical-app industry to have a sudden boom. While our last candidates in 2012 (Obama, Romney) were not immune to a comedic volley of arrows (ex: any Jason Sudekis’ Saturday Night Live portrayals) the amount of material provided was nothing close to this years’ race. In one corner, we have Donald Trump, who seems to be better equipped to be a WWE superstar. His bravado, mildly (extremely) racist comments, and his willingness to go toe-to-toe with any feud, make him a cross between Hulk Hogan and The Rock. In the other corner, we had what appeared to be the more reliable option, until the email scandal broke. When it was uncovered that Clinton had a secret email housing some very damning information, many questioned her integrity, leaving us with two candidates that were easy targets for many. Now that we’ve looked at how this market has grown, it’s time to break down some of the actual games. The game opens up with a text conversation between you (Hillary Clinton) and now-resigned Democratic National Committee Chairwoman Debbie Wasserman Schultz essentially letting you know, “Hey, the bad guys are trying to wipe out the emails.” From here, the game turns into part PACMAN part Angry Birds in which miniature Hillary hops across a circuit board, trying to collect as many emails as she can. The Verdict: I like that we’re at least given some backstory, and the recent resignation of Wasserman Schultz makes the timing even better, so I’ll give it 8 hacked emails out of 10. 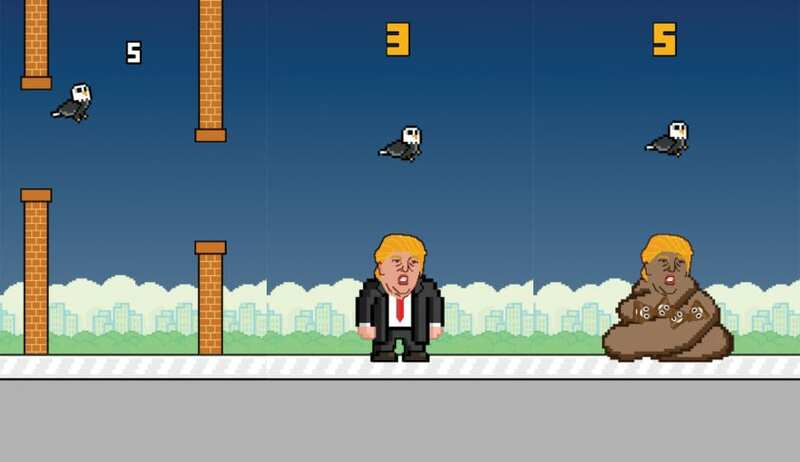 This game is essentially a poorly executed version of Flappy Bird, and in fact, I still don’t fully understand the premise of including a poo-shaped caricature of Trump that pops up every now and then during the game. The Verdict: With an unoriginal premise and a very…distasteful image of Trump, I’ll give this one 3 hairpieces out of 10. Similar to the carnival game whack-a-mole, players must whack down the image of Clinton as she appears on the screen. The game has a variety of versions including Mash Marco, Thump the Trump, Squish Bush, and Hit Mitt. 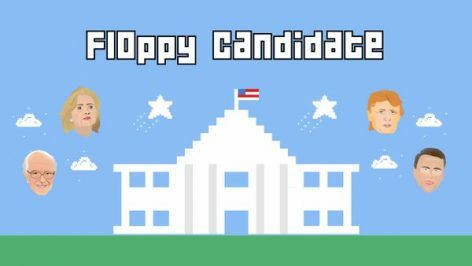 The Verdict: I like the simplicity of the game and the ability to tailor it to your favorite candidate, so I’ll give it a solid 7 awkward Hillary dances out of 10. 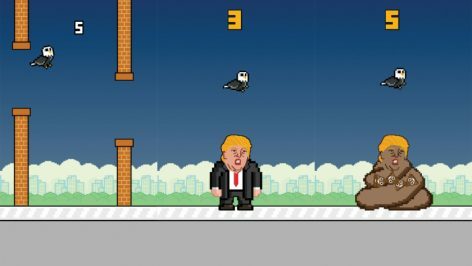 Even The Washington Post — the Pulitzer Prize–winning legacy newspaper that broke Watergate — has entered the mobile-game business with this Flappy Bird knockoff. The caricatures are spot on and the gameplay is a lot better than most of its competitors. The Verdict: I just enjoy the fact that one of the countries biggest news conglomerates has become “hip” to the app game, and I’ll give their first attempt a solid 9 spray-tans out of 10. 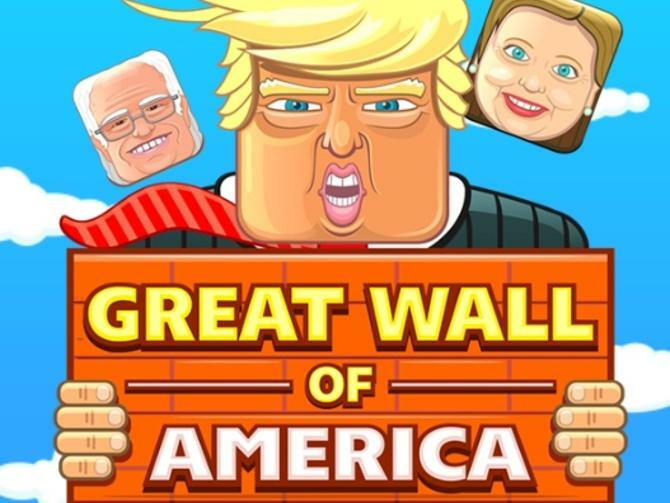 This stacker game forces players to stack now-defunct Republican Candidates like Ben Carson and Ted Cruz in hopes of creating a high enough wall to keep out illegal immigrants. 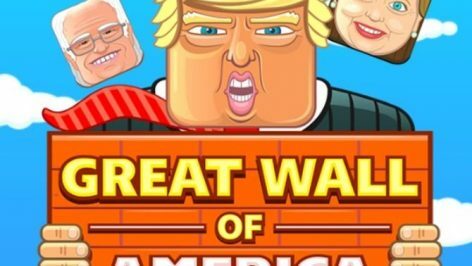 Probably the most unique of the mobile-apps, it even features prominent Trump enemies Megyn Kelly and Vicente Fox. The Verdict: I’ll have to choose this one as my favorite simply because I could play it for longer than 20 minutes. I’ll give this one 10 baby hands out of 10. How can Trump look more like a cartoon, than his actual cartoon?